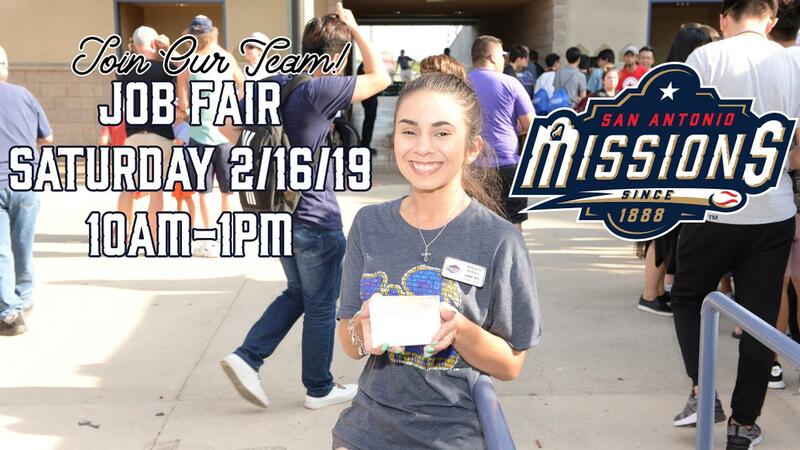 San Antonio - The San Antonio Missions and their catering service, Diamond Creations, will host a job fair on Saturday, February 16 from 10 a.m. to 1 p.m. at Nelson Wolff Stadium. The Missions are looking to fill numerous 2019 seasonal positions in the following categories: bat boys (ages 16-20 only), ticket office employees, production team members (film crew/camera operators), ushers, game operations crew, team store associates, seasonal grounds crew assistant, fun zone attendants, parking attendants, receptionists, hosts, and hostesses. The club will also be looking to hire cleaning crew members for both their day crew (4 p.m.-12 a.m.) and their overnight crew (10 p.m.-6 a.m.). Diamond Creations will be taking applications for the following hourly positions: bartender, beer/food vendors, catering operations, concession stand attendants/cashiers, cooks, dishwashers, kitchen preparation staff, picnic area attendants, runners, supervisors, suite/patio servers and warehouse. Please have your ID, SS card, TABC and Food Handlers Card ready when interviewing. All interested candidates can apply at the Missions' Administrative Office on the first base side of Wolff Stadium. Please enter the stadium on the first base/Hwy 90 side.